The thermal performance of a window or door can be measured in a couple of different ways. This guide aims to explain these methods and to explain the terminology used. 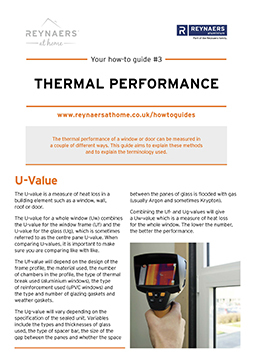 The U-value is a measure of heat loss in a building element such as a window, wall, roof or door. The U-value for a whole window (Uw) combines the U-value for the window frame (Uf) and the U-value for the glass (Ug), which is sometimes referred to as the centre pane U-value. When comparing U-values, it is important to make sure you are comparing like with like. The Uf-value will depend on the design of the frame profile, the material used, the number of chambers in the profile, the type of thermal break used (aluminium windows), the type of reinforcement used (uPVC windows) and the type and number of glazing gaskets and weather gaskets. The Ug-value will vary depending on the specification of the sealed unit. Variables include the types and thicknesses of glass used, the type of spacer bar, the size of the gap between the panes and whether the space between the panes of glass is flooded with gas (usually Argon and sometimes Krypton). Combining the Uf- and Ug-values will give a Uw-value which is a measure of heat loss for the whole window. The lower the number, the better the performance. A few years ago, a new system of measuring the thermal performance in windows and (more recently) doors was introduced. This system measures the thermal performance on a scale from A+ to G, and it is illustrated using a similar graphic to that used to measure the performance of white goods like washing machines and freezers. This provides a balance between the energy that is lost through the window or door, the energy that is gained from the sun shining through the window and any energy lost through air leakage around the frame. 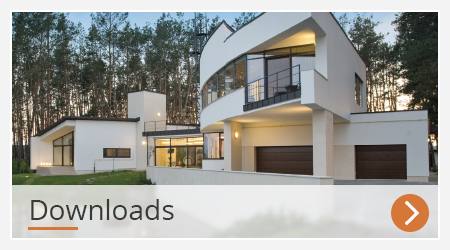 Particularly relevant for new buildings and extensions, SAP (Standard Assessment Procedure) is a measure of likely energy consumption and CO2 emissions of a building. The U-value contributes towards the SAP calculation. You may want to consider the orientation of the building when making your choices. An A-rated window will be designed to maximise the energy gained from the sun. If you are putting big windows or doors in a bright south-facing room, you may find that this makes the room uncomfortably warm in the summer. It may therefore be better to specify windows and doors with a low U-value (good at conserving heat in the winter) and not worry so much about having a good Energy Rating. 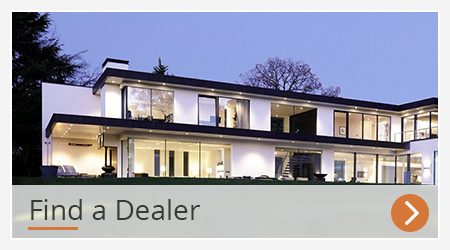 Of course on the north side of the house, you may be glad to have a specification that maximises solar gain. Be careful though – changing the glass specification can change the appearance of the window (the glass may have a different tint), so it is worth trying to keep the glass consistent on each elevation of the property.